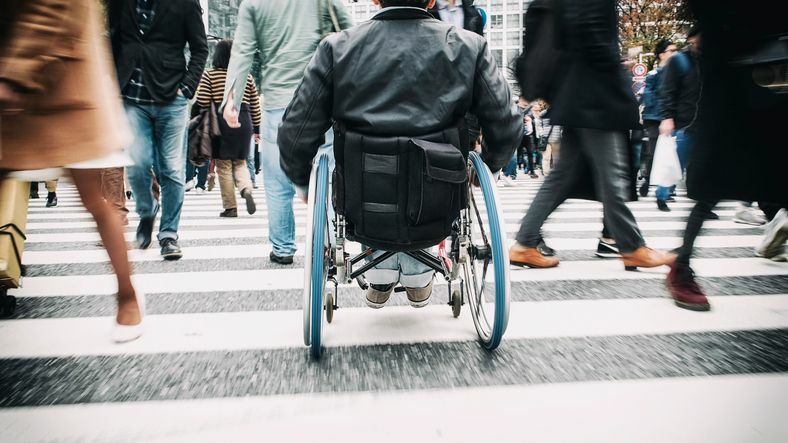 People with disabilities experience higher rates of assault than other populations. Some people see individuals with disabilities as an easy target. Here are a few ways to avoid an attack. Be aware of your surroundings. Many of us are guilty of talking on the phone as we travel through public areas. Often a potential assailant will see this as an opportunity to catch someone unaware. By simply showing that we are paying attention to our surroundings we can lessen our chance of attack by up to 75 percent. Adjust your posture. To the best of your abilities, straighten your posture. A straight posture can help give the impression of awareness (as discussed in #1), improve your peripheral vision, and heighten your sense of hearing. Additionally, improved posture gives off an impression of confidence that is often a deterrent to attack. Work on your reaction to stress. Some people have a hard time talking during stressful situations or they may have muscle spasms. Each of these reactions can be incredibly detrimental in an emergency. Learning techniques such as breathing exercises can help keep your head clear and avoid these unfortunate reactions. Don't prioritize the feelings of others. Often, we do not speak out about what makes us uncomfortable because we are afraid of hurting someone's feelings. Don't be afraid to let someone know they are invading your personal space. Take a self-defense class. While the course you can take may depend on your personal abilities, there are self-defense courses for disabled individuals. This entry was posted in Personal Protection and tagged Personal Safety.